Hi Lily and Edward! I have a question regarding my own frenchie. He just turned 3 and his separation anxiety seems to be growing. We both work from home and I wonder if being around me 24/7 leads to this build-up of anxiety. I also pet him and give him a LOT of attention, I wonder if this is an issue. 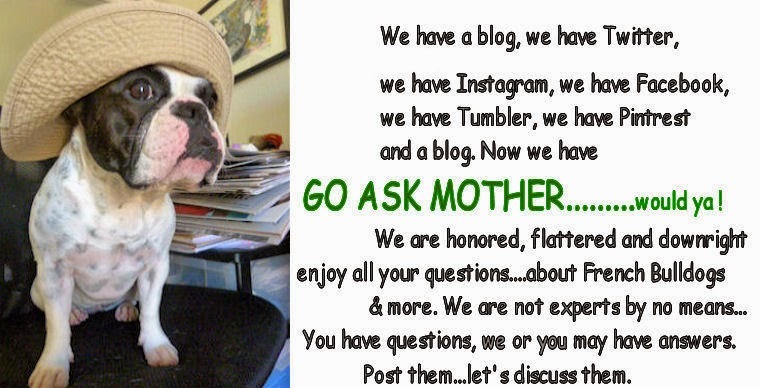 How do you behave around your frenchie when you are home? Do you give them constant attention all day, or do you go on with your own errands and allow them to build up some "independence"? When I leave and come home, I totally ignore them for at least 1 minute. I do ignore them and go about my business when I am at home. Of course they are spoiled rotten and do go a lot of attention otherwise. What to try- I would leave a few times during the day even if it for 5 minutes. Also a local French Bulldog meetup group to help socialize wouldn't hurt. Make sure he gets lots of exercise prior to you leaving the house. Any other suggestions or experiences with separation anxiety? seems that's not only the problem of Ms. Leda...we exactly did what you wrote, we helicoptered around the pup every minute and there was no reason for Easy to stay alone at home... till we had the hell-bow adventure... now we have to learn and to train all things what we ignored the last 5 years within 5 minutes. fortunately it works and we had no mischief by now...i better knock on wood 87 times..
Good advice. Have a fabulous Friday. We would have the same problem but luckily dad and mom work different times so usually one of them is home wif us, AND we always have each other....great advice. Stanley gets a but nutty and our pawrents find that ignoring him until he calms down is helpful. Gosh it must be sad to be alone if yor not yewst to it. I am ok wen my parronts go owt cos I have lots ov toys. Do toys help yu? I think your advice is clever. Mom and dad are always around us, but sometimes they run some errands without us. That way we got used to be home alone from time to time. We think this is great advice! We are good about Mom coming and going. No big fuss is made and we just do our thing, sleep, etc. even when she is home. Great advice! Also, we think crate-training helps. I love to "den" in mine and feel very safe and secure and happy in it. That is wonderful advise for Ms Leda! Great tips! Pike has pretty bad separation anxiety. Crating, calming treats, lots of exercise and a Thundershirt help him. Excellent advice on separation anxiety! The girls are so used to both my husband and I being home all the time, that they do not take kindle to us leaving. They torture us with the STINK eye! Sometimes they act a bit miffed when we get home, but as long as they have each other...they are ok. The real problem will be if I have to leave just one of them..pure torture! Great advice!!!! I did the same when mine were young. I also freeze wet dog food into kong toys, and each dog gets a frozen kong when we leave them home alone. Baby food is another good thing to freeze in kongs. Sometimes, I feel like my dogs WANT me to LEAVE so they can get their kongs! Floyd gets this REALLY bad... He chews when they peeps aren't home.